There are so many people who are eating according to a low carb diet such as the keto diet and do not know if they really are in ketosis or not. One of the best and cheapest ways to find out is to use ketostix or other urine test sticks. By doing so you can easily find out if you are eating the correct things or not and if you are in the state of ketosis. Ketosis means that your body is using fat as the main energy source instead of carbohydrates. This becomes possible since when eating according to a low carb diet you do not get enough carbohydrates. The body then changes and uses ketoacids instead as the main energy source. When the human organs are using ketoacids there is a leftover product that is called ketones. 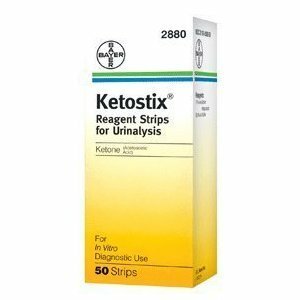 The way a ketostix is working is that the ketones are leaving the body through the urine so by measuring the ketone levels you can see if you are in ketosis or not. I personally use ketostix from Bayer as they are the best ones according to me. I have not tried others but after reading several reviews on the Internet the ones from Bayer seems to be the best ones. I have had some problems finding them in local stores here so I instead bought mine from Amazon. Very easy to find the correct ones and they are also cheaper compared to if you would buy them in a local pharmacy. It is very simple to use the ketostix since all you need to do is take a small sample of your urine (best of you do so in the morning) and dip to stick into it. After 10-15 seconds you will get the results and can see if you are in ketosis or not.